DAIMONOLOGIA: What Great Fish Swallowed Jonah? For the sake of those who love learning and are curious, we present here some things on the ketos. The ketos was bigger than a prison ship, according to Theocles. It was five times bigger than an elephant, according to Aelianus. It was fifty cubits in length, according to Eratosthenes. It was twenty-five fathoms, or a hundred cubits, according to Nearchus. And according to Onesikratos, it was six hundred feet. Orthagoras says it was four plethrons, or a thousand feet in length and fifty in width. Accordingly the divine Fathers who followed these men of old, gave extreme stature to the ketos. Basil the Great said that the ketos was like a large mountain in the magnitude of its body, and they look like islands (Hexaemeron, Hom. 7). When Ambrose says that the ketos swims on the waves, he thinks of it as an island and high mountain that reaches to the sky with the edge of its navel. Eustathios of Antioch, in his Hexaemeron, says that one ketos, called a aspidochelone, is so big that it appears to seamen as if it is an island. Even the moderns say that in Santonia, a city in France found in the British Ocean, a ketos was caught with one hundred and twenty legs, according to Scaliger. And in the Baltic Sea there was another caught, being a hundred cubits in length, according to Ziegler. These are among the many ketoses that we are told have been caught, which are otherwise called whales. 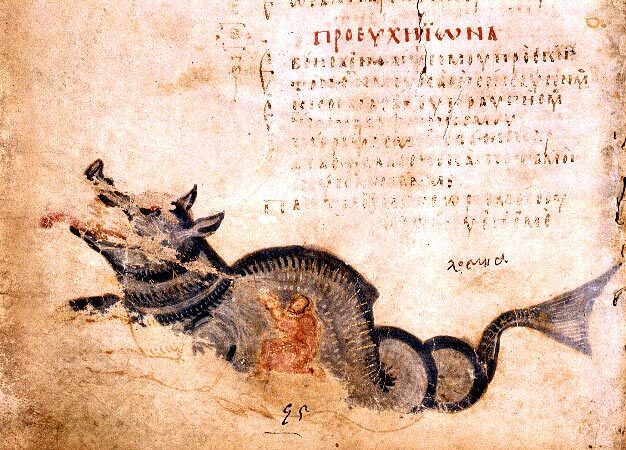 We see therefore that ancient and modern writers with scientific minds, some who had much experience at sea, described the ketos as something much larger than a contemporary sea creature or whale. This leaves the possibility that an aquatic creature may have existed that was much larger in the past few thousand and even few hundred years that is greater in size than something like a whale shark today, which can reach up to fifty feet or fifteen meters (see photo below).